Sukam smiley is an innovative inverter from the leading home inverter manufacturer in India. I know that you would ask me, Smiley is one another inverter in the market, what is special about it? Yes, smiley inverter has something special in it. Especially for tech savvy persons, who want to know what is happening inside their inverter? And who want to control their inverter’s functionality by connecting their laptop wirelessly to inverter. Sukam smiley 850 va pure sine wave inverter comes with all these dream features. When I first looked at the inverter, I was so impressed with the aesthetic design of sukam smiley inverter. You can place this inverter in your living room and showcase it to your relatives and friends who visits your house. Believe me, the outlook of sukam smiley is so aesthetic and adorable. This inverter has inbuilt software which enables the functionality to connect the UPS using wireless technology with Laptop and control the energy usage pattern of inverter during high load and zero load situations. This saves battery charge and makes our user experience even better. Is this a Cheap Plastic Body or Polycarbonate plastic body? Most people would ask something like this and they have questions about the safety and versatility of the outer body structure of ‘smiley’ inverter and its battery trolley. Of course it is made up of plastic, but not that cheap plastic you are thinking of. Outer body of Smiley inverter is made up of a special material called Polycarbonate Plastic. Polycarbonate plastic is a versatile and very strong material which is used in bullet proof car windows. Polycarbonate Plastic body of Sukam Smiley inverter is ‘FIRE PROOF’ and it won’t catch fire even if you spray fire on it. So, Sukam smiley inverter is very safe inverter and always a choice of people who concern about safety. Sukam Smiley 850 va inverter is a 12 v single battery (150 ah) inverter. 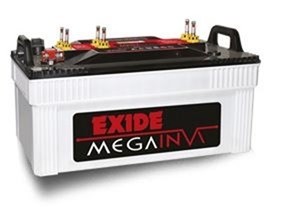 Battery, Inverter and Screw less Trolley comes as a package. Some dealers may over quote during summer. Sukam is always generous in offering long warranty for its Home Ups systems. We didn’t find any major flaws in performance of this inverter. This model is not widely available like sukam ‘Shiny’ model; we expect the company to push this model in the market with little more effort. Sukam smiley comes as a package and the battery in this package is not a tubular battery, it is normal sukam LA (lead acid) battery. It would last for 2 to 3 years maximum. This package would be more valuable if sukam offers Tubular battery with 5 years life expectancy. Drop your comments on this, share your experience with this model and share the price details to our readers, it would be very helpful for other readers to decide on this. Thank you!